Nations eye education as a tool for economic competition, pushing students into sciences and technology while neglecting the liberal arts. The perception that science, technology, engineering and mathematics, or STEM subjects, matter more economically and academically than the humanities and social sciences abounds around the world. China’s plan to turn 42 designated universities into “world class” science and technology powerhouses is the latest and starkest example. Political and educational leaders everywhere hail the university’s role in driving economic growth and continue to introduce policies designed to achieve this goal. Students are responding to these signals by enrolling in increasingly large numbers in the STEM fields at the expense of the arts and social sciences. This is a worrisome trend and merits critical reflection. Universities are no longer quaint preparation grounds for social and professional elites. They are multifaceted, frequently massive corporate entities that foster new knowledge, encourage cultural vitality and help prepare graduates in a vast range of fields to enrich the quality of their lives. At their best, universities are bastions of exuberant debate, unparalleled tolerance and personal discovery. Of course, they are not always at their best, and narrowmindedness in behavior and programming can compromise their ideals and erode their distinctive scholarly qualities. STEM programs are critical components of universities’ curricular and research missions, but so, too, are the liberal arts and these programs should not be marginalized in market-driven, academic prioritization schemes. The contribution of liberal arts to cultural and civic life is crucial and historically enduring. Philosophers and political theorists have deepened our understanding of the ideological systems that govern our lives; historians preserve cultural memory and provide perspective on contemporary conflicts; novelists, poets and artists, both those who teach in universities and those who have studied in them, exhibit the infinite power of the imagination. Nations which nourish these pursuits enhance the civility and spirit of their communities. 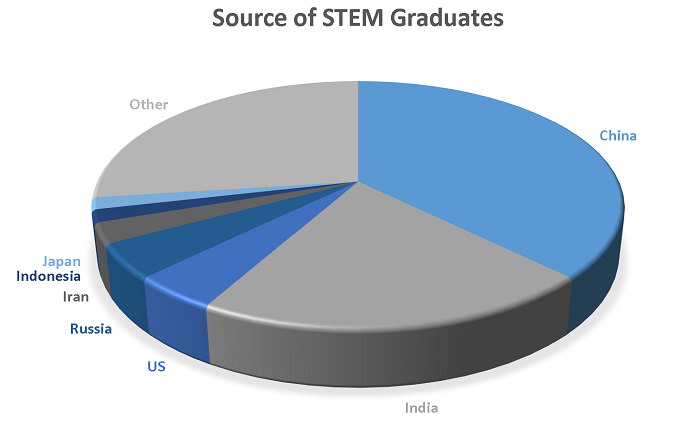 And like engineers and computer scientists, social science and humanities graduates contribute enormously to economic life. Tourists everywhere flock to galleries, museums and historic sites, staffed so often by higher education graduates, making tourism one of the world’s largest industries. The health studies student who writes a thesis on food insecurity has learned how to conduct independent research, problem-solve, and communicate effectively, skills that companies consider essential. Those who are multilingual and have knowledge of foreign cultures help forge economic and social relations among nations. To understand differentiated learning strategies, now employed in the world’s best classrooms, teachers require a deep understanding of child development theories taught in education and psychology programs. University graduates often end up in rewarding jobs that seem unrelated to their program specialization, but this is evidence of the versatility, not the irrelevance, of a high quality university education. Enlightened employers and recruiters in the STEM sector understand the added value of broad academic training. Stewart Butterfield, co-founder and CEO of Slack Technologies, a remarkably successful American message-platforming startup, holds an undergraduate philosophy degree from the University of Victoria in British Columbia and a master’s degree in the philosophy and history of science from Cambridge. As he told Forbes Magazine, “Studying philosophy taught me two things. I learned how to write really clearly. I learned how to follow an argument all the way down, which is invaluable in running meetings. And when I studied the history of science, I learned about the ways that everyone believes something is true – like the old notion of some kind of ether in the air propagating gravitational forces – until they realized that it wasn’t true.” He also hired Anna Pickard, who holds a theater degree from Britain, to be his editorial director, describing how he was impressed by her creative writing and her inventive “cat impersonations. Of course, no university graduate can be guaranteed a lucrative and rewarding career. 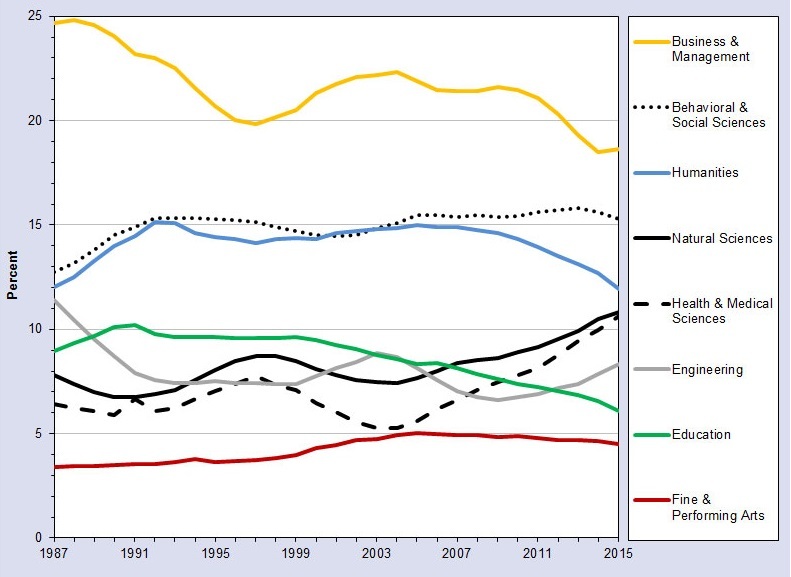 Higher education is not insulated from economic downturns and instability. Studies in Canada, for example, show that in buoyant times, STEM graduates earn more than those from the arts and social sciences, though in the long term, the latter thrive and do far better than those with college level or no post-secondary education. In bad times, graduates from all fields struggle, including those from applied professional programs. In the late 1990s, in response to industry shortages, the government of the province of Ontario, injected millions of dollars into universities that would commit to doubling the number of engineering and computer science graduates. In a few short years, NORTEL Networks, the Canadian-based high-tech giant which led the lobbying effort to expand the campus training programs, collapsed, costing thousands of employees their jobs and leaving universities with under-enrolled science and tech departments. One enduring problem is precarious or part-time employment. This especially affects unskilled labor, but the university educated are not immune from part-time work with low wages and no benefits. Even universities fuel the new precariousness. Ontario’s post-secondary institutions depend heavily on highly trained contractually-limited faculty to teach undergraduate and diploma students, a phenomenon common throughout the economy in many fields – not simply the arts. In the United States, between 1975 and 2014, the proportion of faculty with full-time tenured positions fell by 26 percent and the number of those with part-time instructional appointments grew by 70 percent. Precarious employment, a systemic problem from which no sector is immune, must be addressed by enlightened social and economic policy. Notwithstanding the undulations of the international economy, science and technology are considered leaders in the innovation wars now underway in advanced economies, and universities train the soldiers for the innovation frontlines. Yet high-tech employment by no means leads these nations’ occupational sectors, constituting just 5.6 percent of the labor force in Canada and 5.9 percent in the United States. Leaders of educational institutions, concerned about the employability of graduates, should avoid over-investing in these areas and instead sustain academic and curricular diversity, including the liberal arts, which engage students in crucial questions about the human condition, one of which is the future of work itself. As physicist Stephen Hawking points out, artificial intelligence and robotics are likely to render huge portions of the world’s population unemployable. “I believe that society needs to confront this question before it is upon us: if machines are capable of doing almost any work humans can do, what will humans do?” This is a profound challenge requiring the deep thinking of real people in all academic disciplines. China, especially, should cultivate such broad scholarship in its universities, which are not known for fostering academic freedom, critical thinking and intellectual autonomy. Their institutions’ high rankings in the STEM areas will seem rather hollow in the absence of these core university values. *Paul Axelrod is a professor emeritus and former dean of the Faculty of Education at York University in Toronto, Canada. He has written widely on the history and policy development of higher education. His publications include Values in Conflict: The University, the Marketplace and the Trials of Liberal Education and Making Policy in Turbulent Times: Challenges and Prospects for Post-Secondary Education (co-editor).